Oh that's amazing for a pattern! different sizes and weights of yarn! thanks for sharing. And Yes, you seriously need to have it modeled by the new baby! What a gorgeous hat, I've just cast on for this! Looking forward to seeing it on your new arrival (when it does decide to make an appearance)! It couldn't be cuter...except on your baby's head. I made this one for my nephew. It is so easy, and incredibly cute! 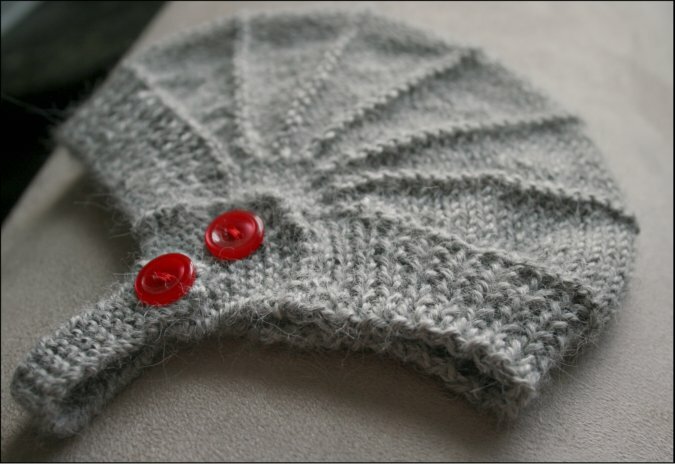 It seems to look adorable no matter the yarn, but the buttons used are very important! This is beautiful! Lovely details... especially the buttons! Oh, I love the gray and red. So cute! You are going to have the best-dressed baby boy in town for sure! Wow, so many options! I love the button detail. I think that might be the perfect little hat. I'l have to give it a try! The Aviatrix has been in my Ravelry Queue for ages now. Your version is just adorable. Now I am inspired to knit my own. Thank you! I started this for my little guy. However he likes to be held so..... I had to put it hold. Your's looks so cute! Oooohhh...I must make this hat! Thanks for posting! Aviatrix was on my list of patterns that I never knit for my first child and so MUST knit for my second (and last!) before she outgrows them all. I finished it last week but, being 2, she now has strong opinions about what she will and will not wear and, sadly, Aviatrix is apparently not on her approved list. Can't wait to see yours modeled! Do you have a.pattern for this hat?